We already had our own logo, but for our movies we also wanted an ‘audio logo’. A nice melody that helps you recognizing videos about Organ Kids, that was the question we asked Bart Wuilmus. He accepted the challenge and so now there is a real theme for Orgelkids. But Bart had a much better idea! 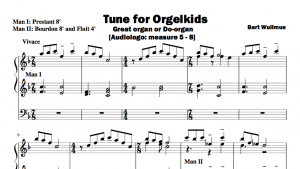 “It will be even better if that theme is part of a complete piece that you can play on all kinds of organs.” So he offered to make the sheet music available to anyone who joins our Orgelkids project. You can play the piece on a large organ with pedal, but also on the small Do-organ after children have built it up. And so here is for you: the sheet music (PDF) and. .. a nice video in which you see Bart playing on two different organs. Organs: Verschueren (2002), Do-organ Wim Janssen (2015). Bart, Peter and Jan, thank you very much for your wonderful contribution to Orgelkids! Have a great idea for Orgelkids? We'd love to hear from you.